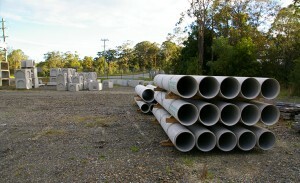 As the North Coast supplier of Fibre Reinforced Concrete Pipe manufactured by Vantage pipes we can supply all of your Stormwater Drainage needs. We manufacture and stock concrete pits from 450mm up to 900mm with risers to suit any depth. We can manufacture any size pit to suit your requirements to order. Fine Form stocks headwalls to suit pipes up to 450dia and can manufacture headwalls to any size quickly and efficiently.